I forgot about how much I loved Maltesers until recently. It must have been a bag that we had at the movies which made me remember how wonderful those little chocolate balls were. Perfect on their own or thrown in with some popcorn, it’s a great theatre snack. 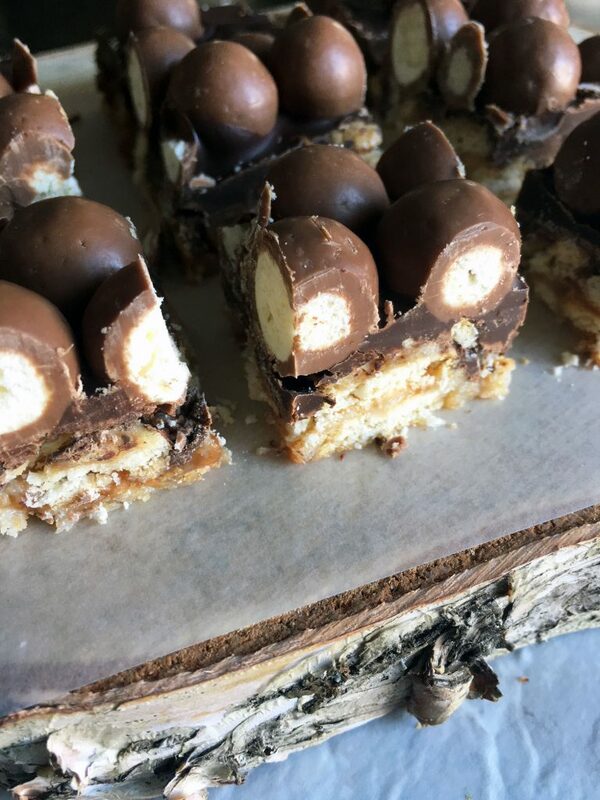 Throw these Maltesers on top of the already amazing Skor bars and you have got yourself something amazing and so indulgent. These would be great as part of your dessert table for the holidays. Pack them up in a box or a treat bag and you will make someone very happy. 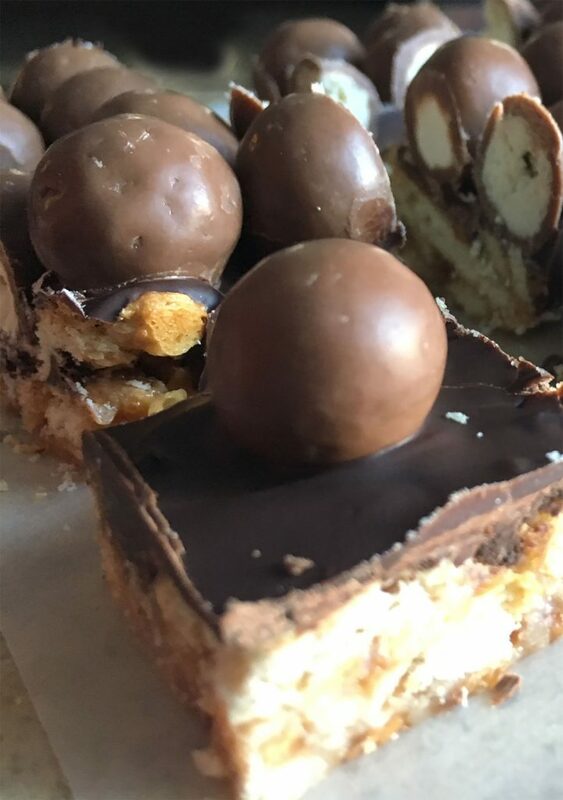 If you space the chocolate balls apart, you will only need one 165g bag for an 8″ square pan with a few left for snacking on. For a more dramatic effect, pack them all together. If you take this route, you will need a couple bags. Be warned…these are dangerously good and if you have no self-control, you will not want them hanging out on your counter. Trust me. 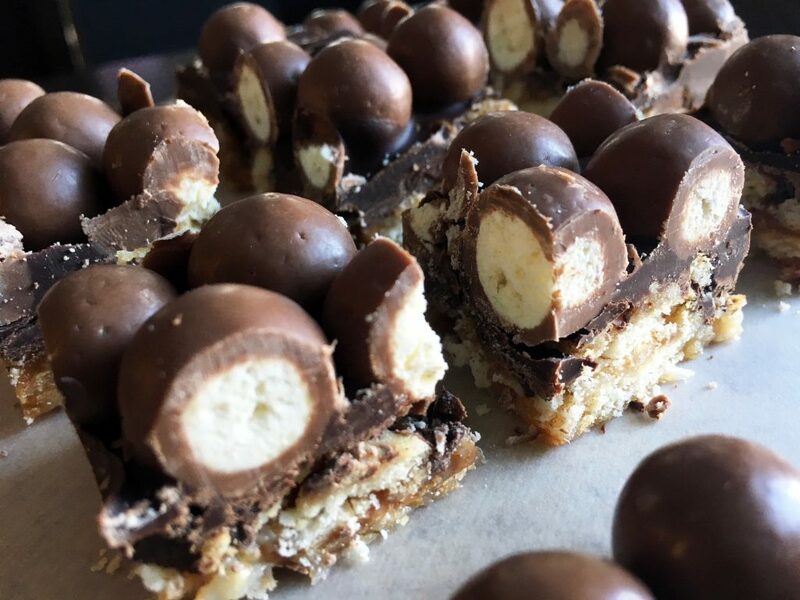 Maltesers are great on their own and perfect with popcorn. They are also an easy way to decorate. Check out this cake I had made for my dad’s birthday. Add the condensed milk and Skor chips. Place mixture into a parchment lined 8" square pan and bake at 350 degrees for 10 minutes. Pour the chocolate chips on top and place back in the oven until the chips are melted. Smooth chocolate with a knife and let partially cool. Add the Maltesers to the still melted chocolate and let cool.